Kofta's are fried dumplings which can be made from different vegetables like Lauki (bottle gourd), carrots, potatoes or even mix vegetables. This particular recipe uses cabbage. It is quick and easy to make tasty cabbage kofta recipe made with grated cabbage, gram flour and simple ingredients which is easily available in our kitchen. 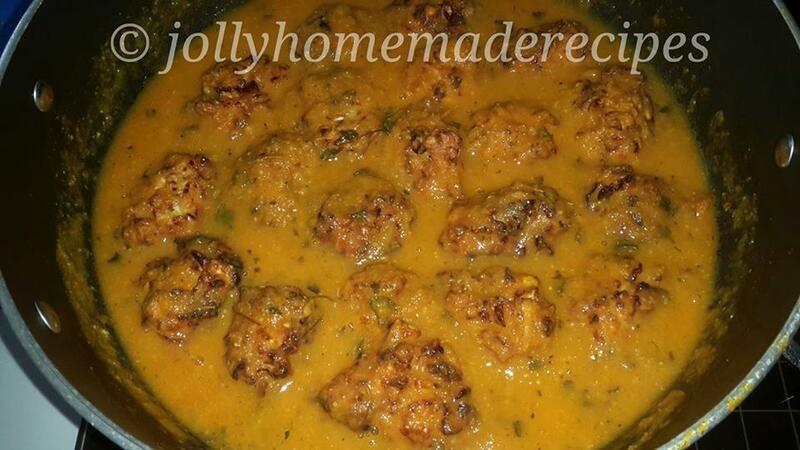 Cabbage kofta's are a wonderful treat to every day lunch/dinner meal. They are vegetarian alternative to meatball. This dish looks so colorful and appetizing that even the people who think that cabbage is such a boring vegetable and do not like to eat traditional cabbage ki sabzi will be tempted to eat. This dish is under our Foodie Monday Blog hop theme, and we are back with winter vegetables (either desi or videsi), and I am presenting the dishes of our own choices, I selected the Green Cabbage. 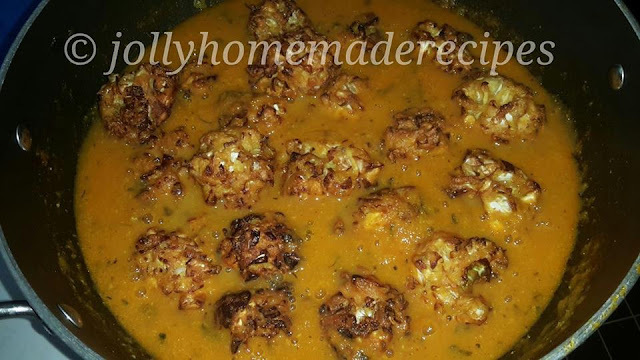 I love the cabbage but my husband doesn't like it, so I decided this time to make some different dish from cabbage and made this kofta from cabbage. 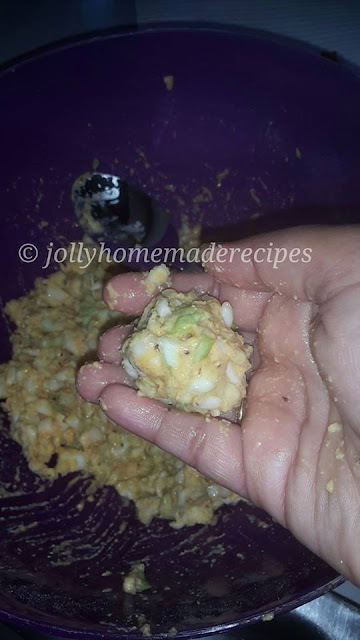 You will definitely love the taste of this cabbage, the taste is absolutely different from the normal cabbage ki sabzi !!!!! Cabbage kofta can be served with roti, parathas or naan. 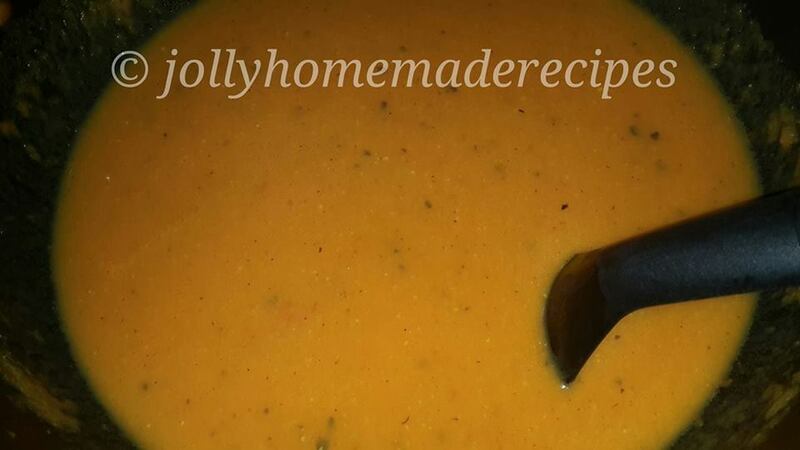 It also goes well with steamed rice or jeera rice. 1. Inmixing bowl, take the finely chopped cabbage, ajwain/carom seeds, turmeric powder, red chili powder, garam masala powder, asafoetida/hing, curd/yogurt and salt. 2. Add besan/gram flour & baking soda and mix well. 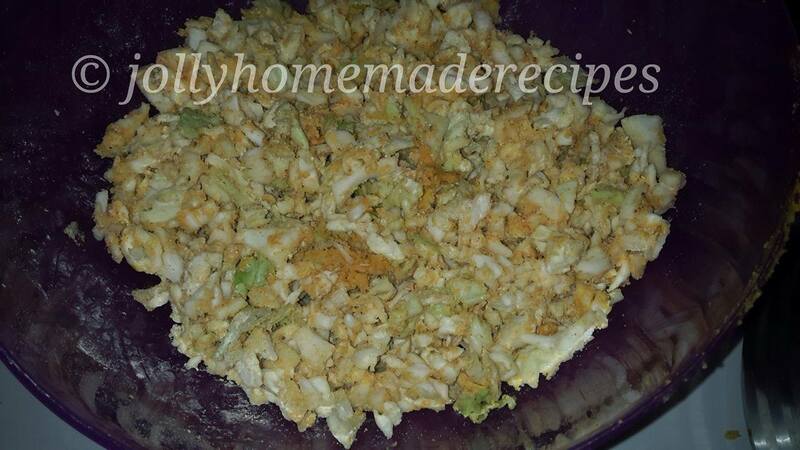 Keep the cabbage mixture aside for about 25-30 mins. 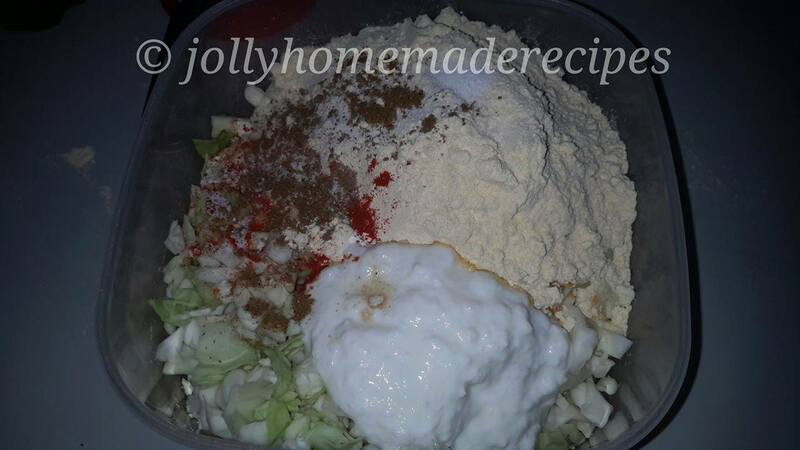 The kofta mixture would have become moist as the cabbage would release its juices. 3. If the mixture looks dry, then you can add some water. 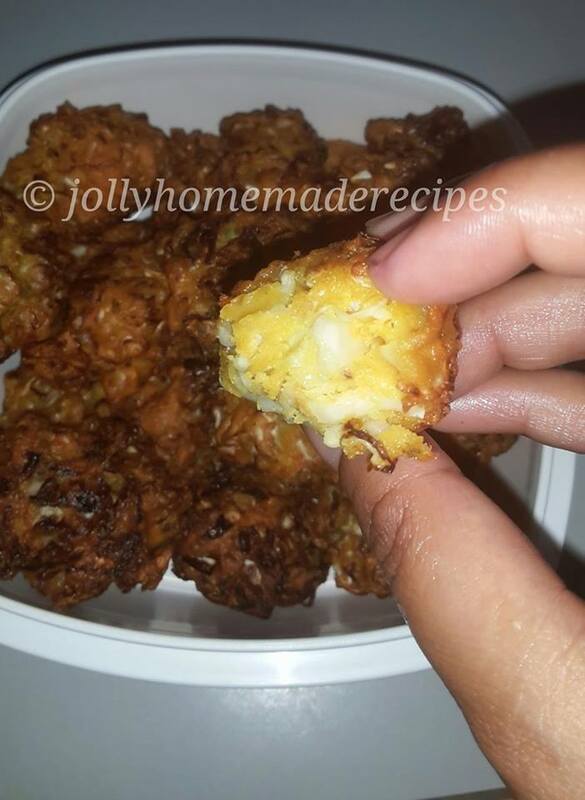 If its too moist and batter like, then no need to add any water. I added about 1/4 cup water....stir very well. 4. 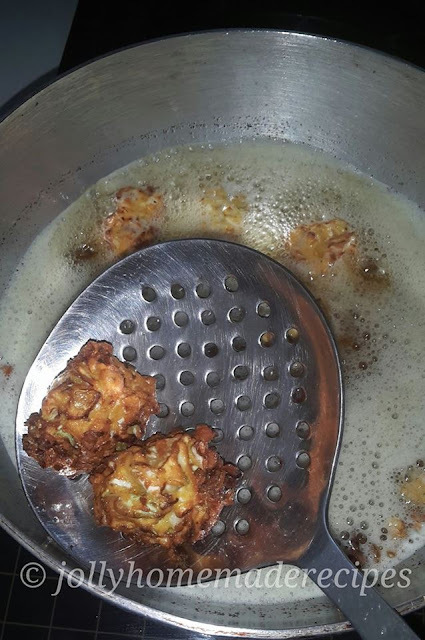 Heat oil for deep frying the cabbage koftas in a kadai. 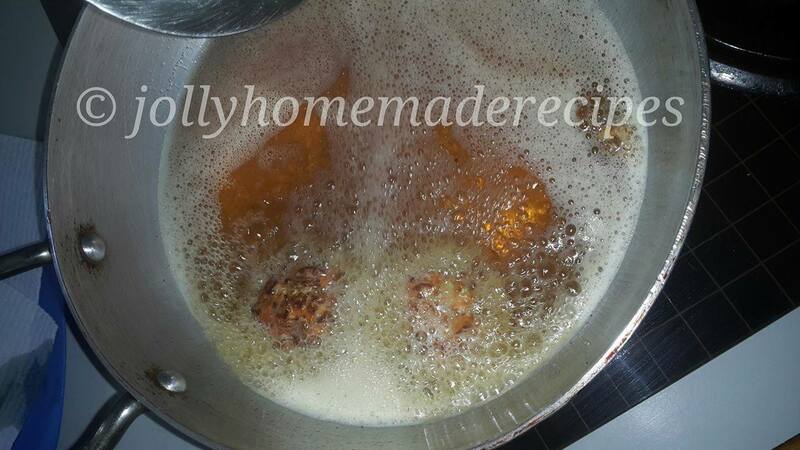 Make a small balls of batter and fry the kofta till crisp and golden in medium hot oil. 5. Drain the cabbage kofta's on paper towels to remove excess oil and keep aside. 1. 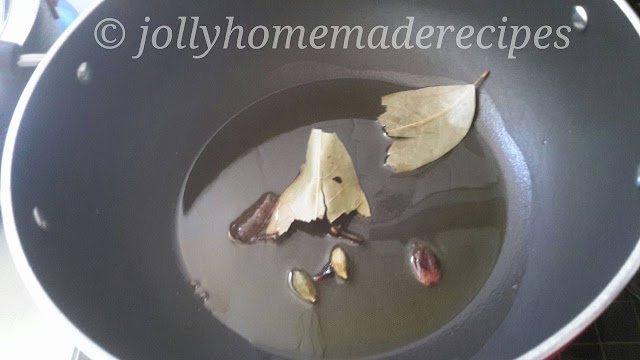 Heat a 2 tbsp olive oil in a kadai, first add the bay leaf, black cardamom, green cardamoms, cinnamon and cloves. fry the whole spices till fragrant.... about 10-15 seconds. 2. 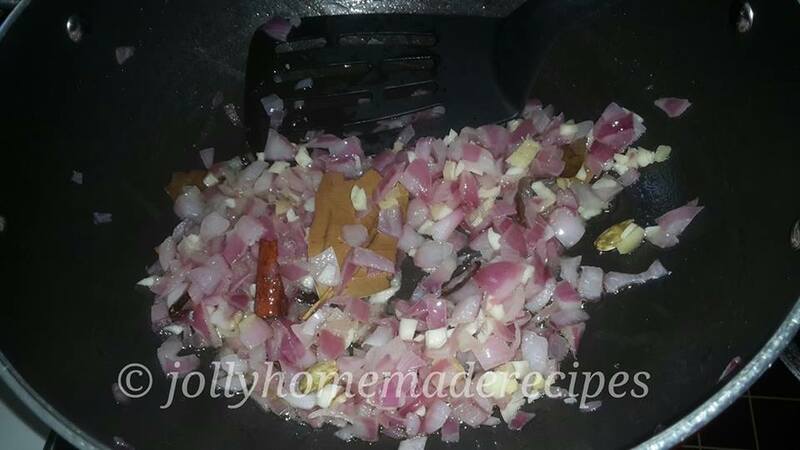 Add the chopped onions and fry till the onions get golden. 3. 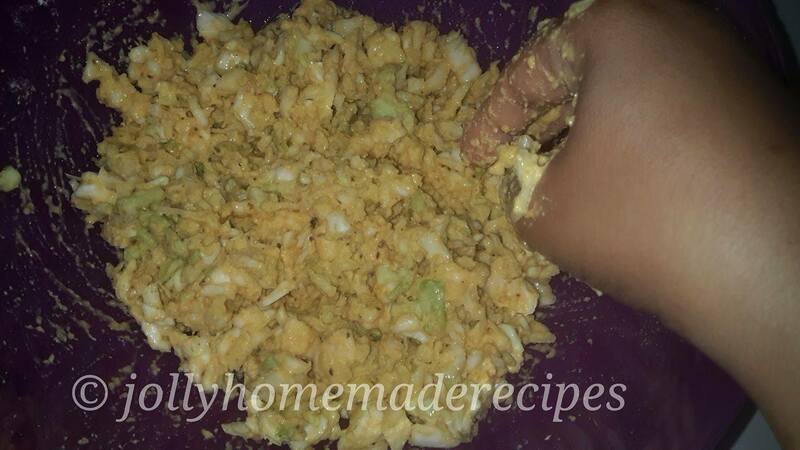 Add the crushed ginger-garlic and saute till the raw aroma of the ginger-garlic goes away. 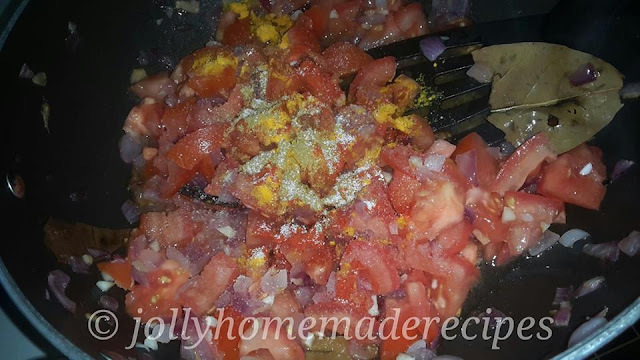 Add the tomatoes and all the dry spice powders - turmeric powder, red chili powder, coriander powder. 4. 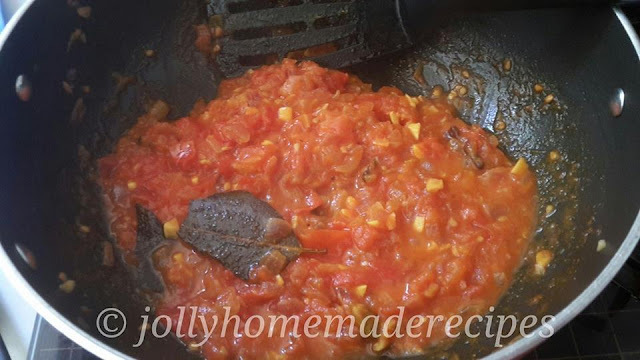 Stir and saute till tomatoes soften and oil starts to leave the sides of the mixture. 5. 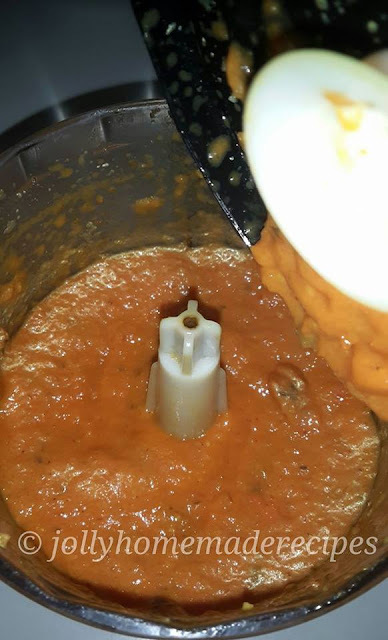 Let this mixture cool and then grind this saute onion-tomato mixture with some water to a smooth paste with about 1/2 cup water. 6. In the same pan, gently heat about 1 tbsp oil or butter. Add the ground masala paste and stir with the oil. 7. Add salt & simmer the mixture till it thickens a bit and reaches a medium gravy consistency. Make sure the curry should be cooked well. 8. Then add cream(its optional) and add the crushed kasuri methi & stir again. Switch off the fire. 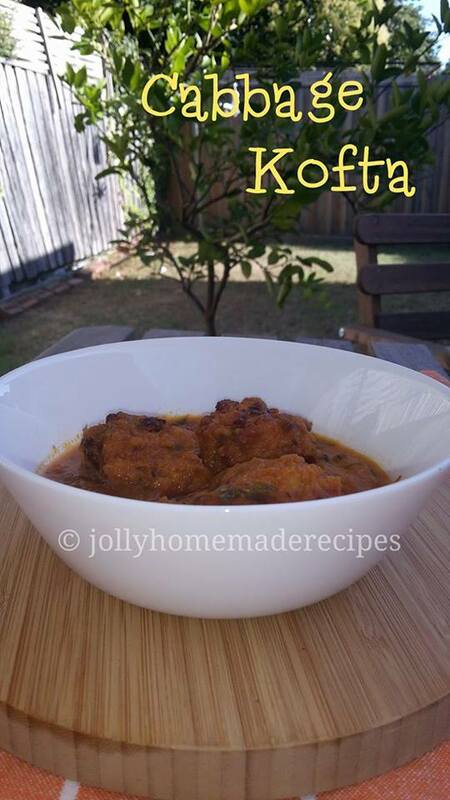 Note*- If serving immediately, then add the cabbage koftas. if serving later, then reheat the curry/sauce and then add the cabbage kofta. 9. 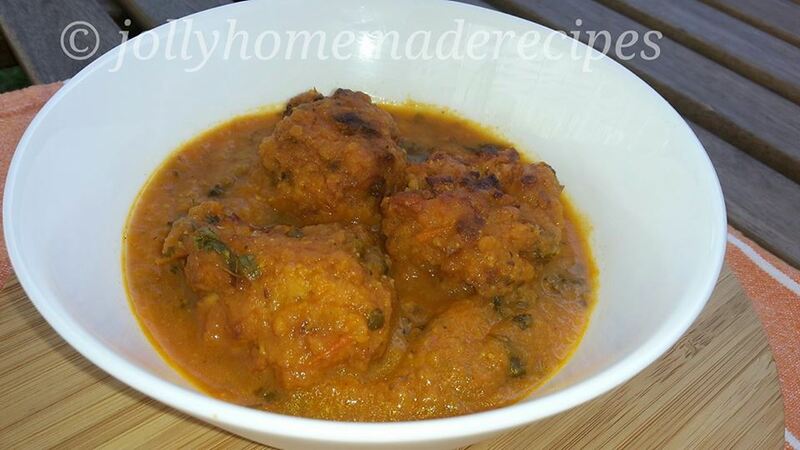 Serve the hot cabbage kofta curry goes with rotis, naan and steamed rice or jeera rice. 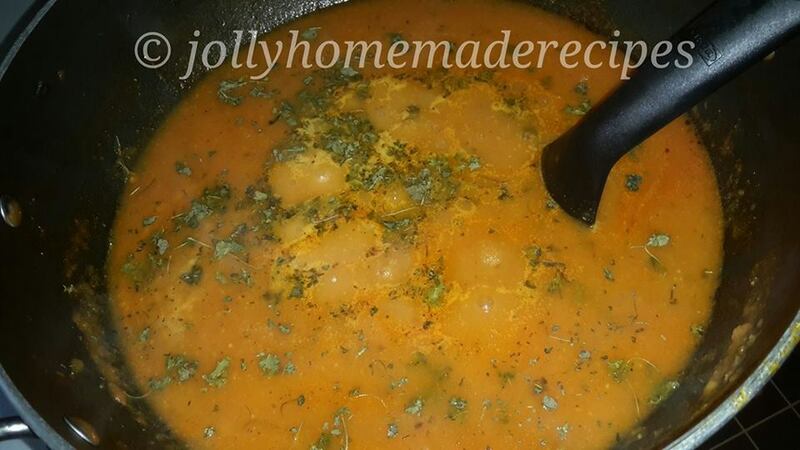 Garnish with coriander leaves before serving the cabbage kofta. 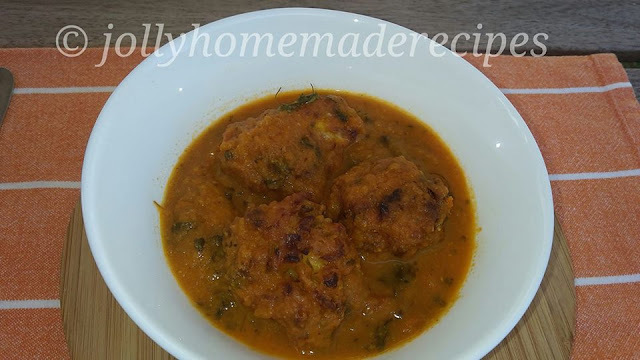 You can check my video of "How to make Cabbage Kofta on Youtube"
Cabbage is my favorite vegetable. 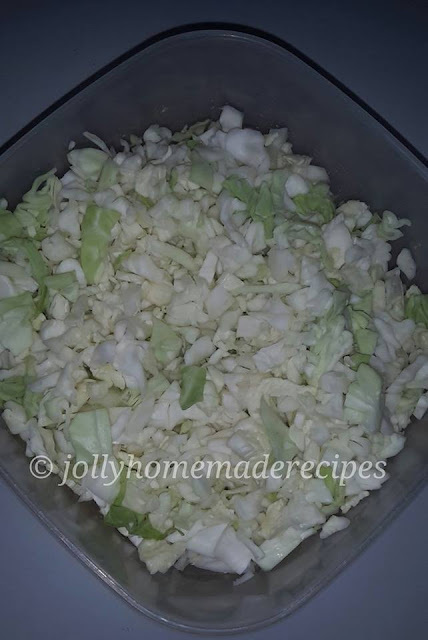 I love to add cabbage to many dishes from soups, salads, noodles and fried rice. This curry looks so tempting, will try it for sure. Thanks for sharing. 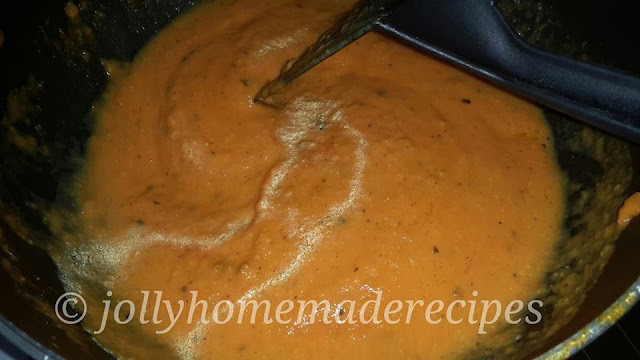 Really That Looks Delicious,Really I Like Your Cabbage Recipe,when i read your blog i cant stop water from my mouth,really delicious recipe..
Not only the recipe looks wonderful, but I’m loving it! So exotic and delicious. 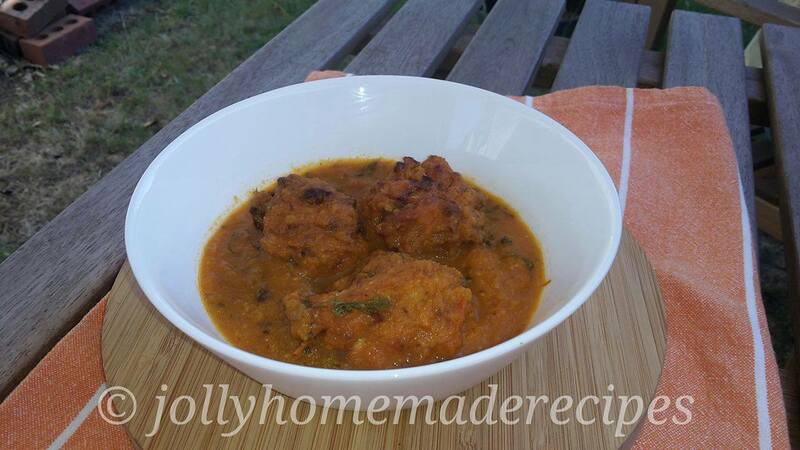 Cabbage Kofta is really good and I’m happy we have another great recipe to try Jolly!